Chris has won awards from the University of Idaho in fiction and poetry, and from Sigma Tau Delta, National English Honor Society, in short fiction. Chris has worked for numerous publications including magazines and newspapers. He is a compulsive video gamer, as well as a compulsive writer with a bachellor\'s in English from the University of Idaho, and a Masters of Creative Writing from the University of Washington. For some reason, he also thought a minor in film studies would be a good companion for all the word-stuff. 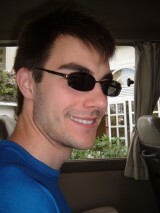 He is currently attending The University of Washington and may be pursuing a PhD in Medieval Studies this fall. Chris grew up in Burbank California not far from Warner Bros. Studios. He lived there quite comfortably - excepting minor brushes - for fourteen years until he moved to Hailey, Idaho in 1997, and then, four years after that, to Moscow, Idaho. He currently resides with his beautiful wife in Seattle. Chris began writing for Gamesfirst.com in the Spring of 2004 and has since then interviewed developers such as Bethesda, journeyed to the land of E3, and blistered his fingers getting articles in on time. A lover of Adventure games, Action, FPS, Strategy, Role Playing and...pretty much everything, Chris is best known as the \"racing game guy.\"
Chris Martin has written 183 articles.